The first thing you're bound to notice about these palettes is that the embossing on each shade evokes the tulle details of Dior designer Maria Grazia Chiuri's first collection, and the "Dior" letters stamped on the centre shade look endearingly hand-stitched. The effect is feminine and whimsical and eternally optimistic, especially when combined with the rosy-hued shades. Love. 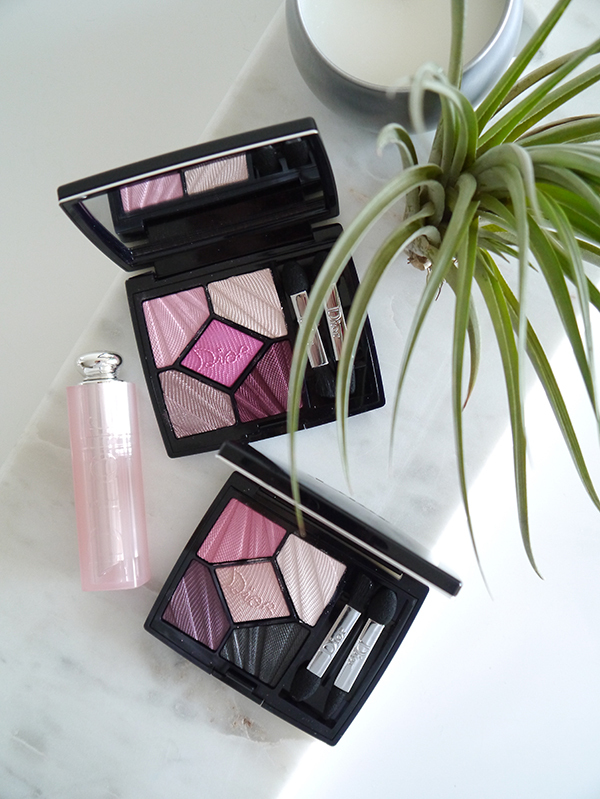 The name of these limited edition Dior 5 Couleurs palettes—"Glow Addict"—also brings to mind the bestselling Dior Addict Lip Glow colour-adjusting lip balms, which are now available in new shades and finishes. Both products feature the same sort of lit-from-within glow-y pink tones that are just so suited for 24/7 day-to-night wear during the spring. 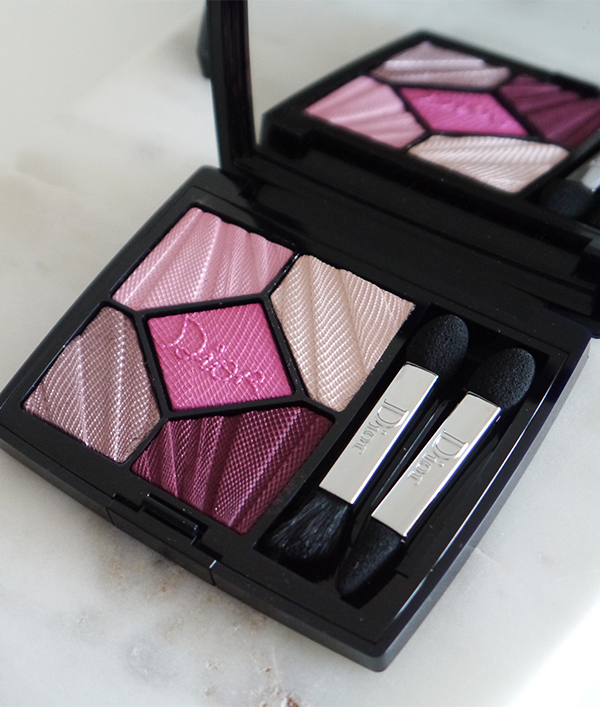 In fact, I think of these eyeshadow palettes as Dior Addict Lip Glow for the eyes! 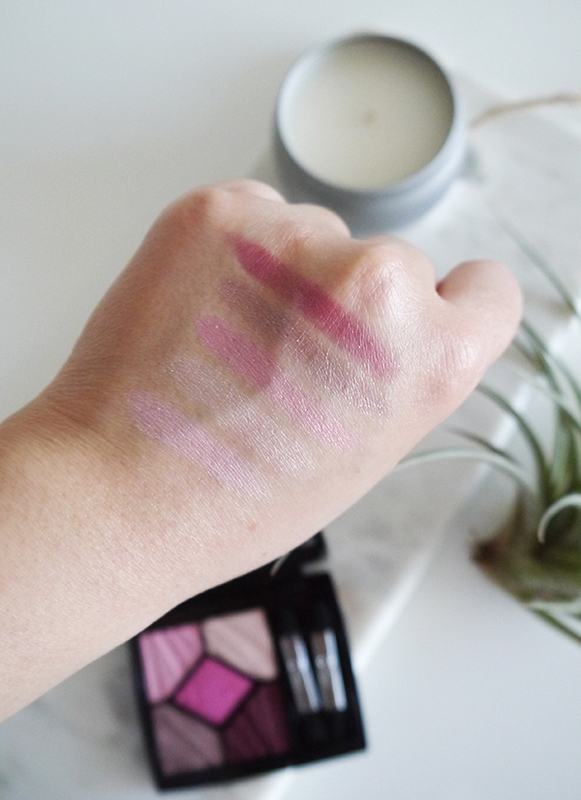 I'd wear the 887 'Thrill' palette (shown above and swatched below) with Dior Addict Lip Glow in 'Lilac' and 'Raspberry'. All of these have a slightly cooler undertone firmly rooted in the lilacs, magentas, and fuchsias of the pink family. This palette would be a great choice for someone who already has a good selection of neutrals, nudes, and smoky shades in their beauty kit and may be apprehensive about playing with more colour, but wants to experiment. Pinks, lilacs, and purples are easy work into eye makeup looks without veering into OTT territory. 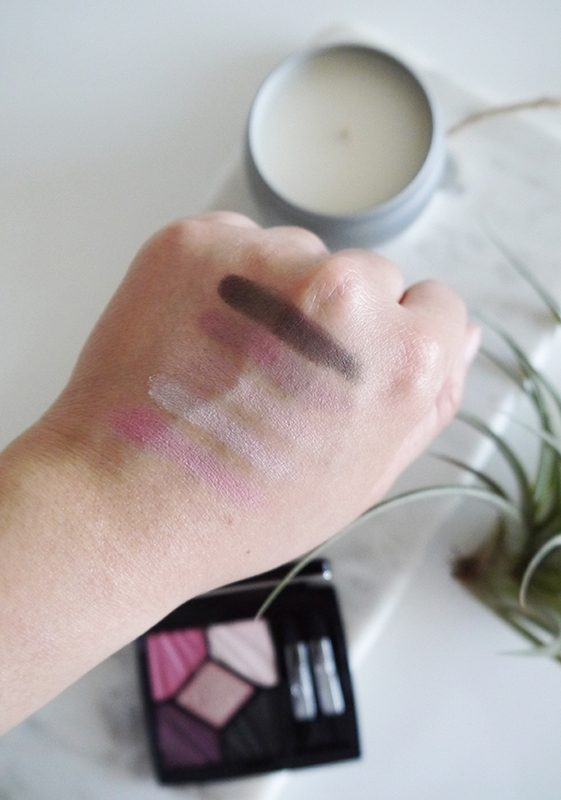 The 667 'Flirt' palette (shown above and swatched below) is also on the cool side, with shades that range from champagne to ballet slipper pink, burgundy, and a smoky charcoal; I'd probably pair it with the true pinks in the Dior Addict Lip Glow range. Of the two palettes, this one is more versatile for someone who doesn't have a lot of eyeshadows. The burgundy and smoky charcoal can deepen eye looks for evening, and you can combine the charcoal and two lighter shades of pink for a neutral eye that'd complement any lip colour. 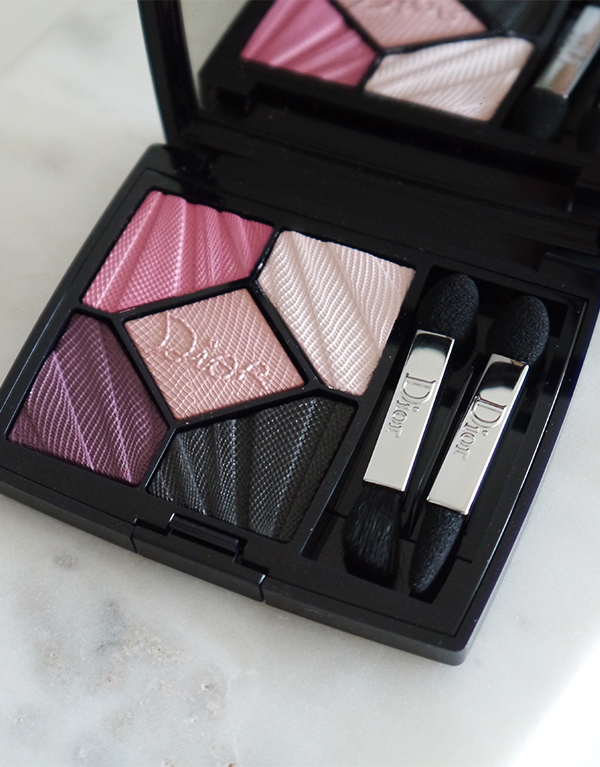 I rarely wear eyeshadow, but I made an exception for the Dior 5 Couleurs Glow Addict Eyeshadow Palettes in the last couple weeks because #producttesting and #science. Are they as stellar as I remember them to be? Yes, as it turns out. As with all powder eyeshadows, the basic rules apply: a primer is a must, use good brushes, and blend, blend, blend. The shadows go on soft with a brush but have a more vibrant intensity when you use the included swab applicators. Their build-able pigments have a soft iridescence and stay put with no fallout or creasing all day. And this is kind of hard to describe, but the eyeshadow just looks luxe and expensive—it has a certain dimensionality in how it catches the light and subtly enhances eyes, making other eyeshadows seem either too flat or too overdone. What else can I say? Covetable limited edition + wearable and pretty shades = ideal for spring. P.S. 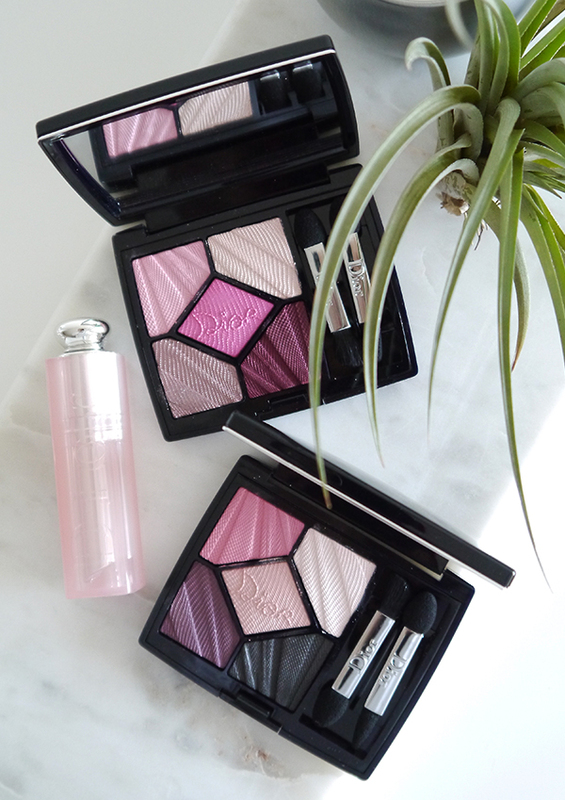 For more tips on how to get the most out of any Dior eyeshadow palette, check out this post featuring tips from Dior makeup artist Pascal Grand'Maison. Those colours are SO ROMANTIC!! I haven't dug into my palettes yet, they are so beautiful and I love the tulle print so I'll be sad once I ruin them. I'm just thinking that Thrill would be gorgeous to use for some kind of romantic photo session haha. Yes! I have to admit, I'm drawn to how pretty Thrill is, but for day-to-day I'd probably wear Flirt more often.